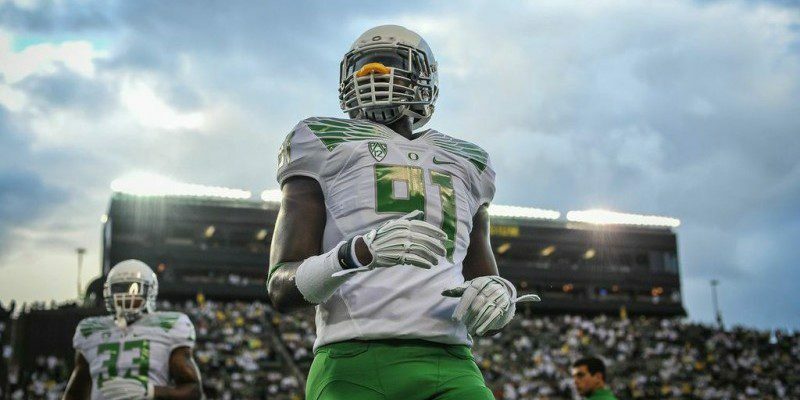 This is the first in a series of articles looking at the top eight Duck NFL Draft prospects. The series will progress according to draft projections, starting with the lowest projected prospect, Tony Washington Jr.
No. 8: Tony Washington Jr.
Overview: Tony Washington was a solid player at Oregon. 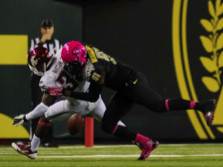 Last year, the senior anchored a Ducks’ run defense improved as the season progressed. Washington recorded 60 total tackles, including 11.5 TFL and six sacks, and led the team with three forced fumbles and three fumbles recovered. Washington was also the vocal leader of the Ducks’ defense, serving as a mentor to younger players. Washington’s big play ability can turn a game around, sparking both the offense and defense. This ability was on display in this year’s Rose Bowl, as Washington made two huge momentum-swinging plays, and turned the tide in the Ducks’ favor. However, to say that Washington disappointed at the NFL Combine is something of an understatement. His 40-time of 4.99 seconds was the slowest among the LB group, and his 17 reps on bench press was the third fewest in the same group. In short, a team will not draft Washington for his athletic upside. Washington is as advertised – a solid run stopper with great instincts to disrupt the backfield. Thus, Washington will likely succeed in the NFL provided that his team devotes the resources necessary to convert him into a defensive lineman. Strengths: Washington is an above average player against the run who very rarely misses tackles once in the backfield. Although a seemingly slow player, Washington has top-tier explosiveness and quickness on the line. But when one imagines him as a defensive lineman, his athleticism in the trenches should serve him well as a pro. In terms of intangibles, Washington shows a strong work ethic and dedication to improve throughout his career at Oregon. Weaknesses: Washington needs to improve upon the physical aspects of his game, particularly his speed getting up the field and his strength. Success in the NFL centers on a player’s physical attributes. Simply put, if combine numbers are accurate predictors of a player’s athleticism, Washington faces an uphill battle to become a contributing player on an NFL roster. These numbers undoubtedly raised concern in the minds of NFL GM’s, as linebackers should exemplify the twin pillars of athleticism and strength. During the National Championship against Ohio State, Washington along with the rest of the Oregon defense, got pushed around. His performance showed that Washington needs to work on his consistency, yet another factor for the success of any NFL player. Washington strenghts are as a rusher, not in coverage. Along with his physical weaknesses, Washington also is a liability in pass coverage. Because of his lack of speed, he can struggle to keep up with receivers in coverage, and often times he can look lost if the opposition implements any confusing routes. Most importantly, his inconsistency as a pass rusher as a DE. Sometimes Washington explodes off the ball and is very disruptive, and other times he takes a long path to the QB or fails to use his hands to gain leverage.